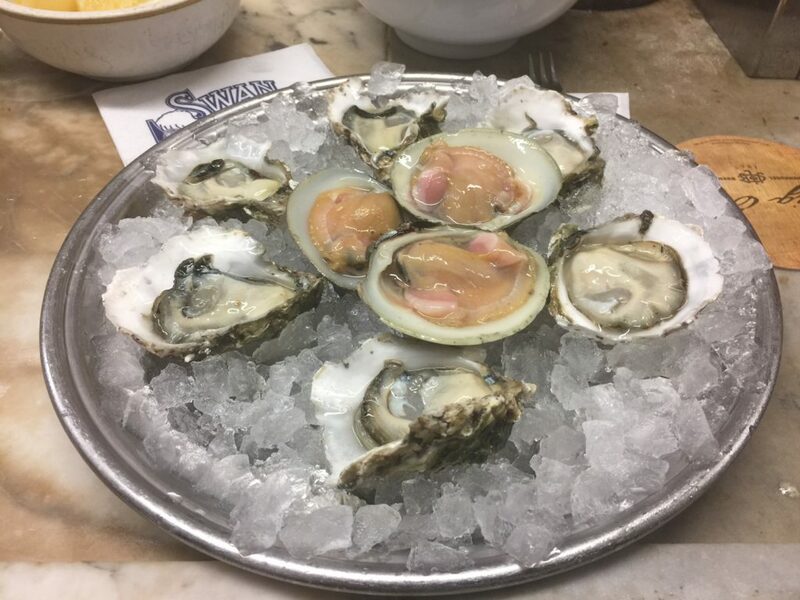 Because of three people, my dining companion and I spend five hours trekking to Swan Oyster Depot in Nob Hill. Call me crazy, but just don’t ever call me apathetic (pathetic is fine; just not apathetic). We found a parking space *way* up high (it is in the Nob Hill neighborhood), but only about three blocks away. Even though it looks flat, if you see that intersection where the person is crossing the street, and take a right there? You’ll be walking up at a 45-degree angle. You’ll also be waiting in line – justifiably, I will add. To make the line seem longer, right through that glass window on the left side of the restaurant is a tantalizing display of today’s offerings. 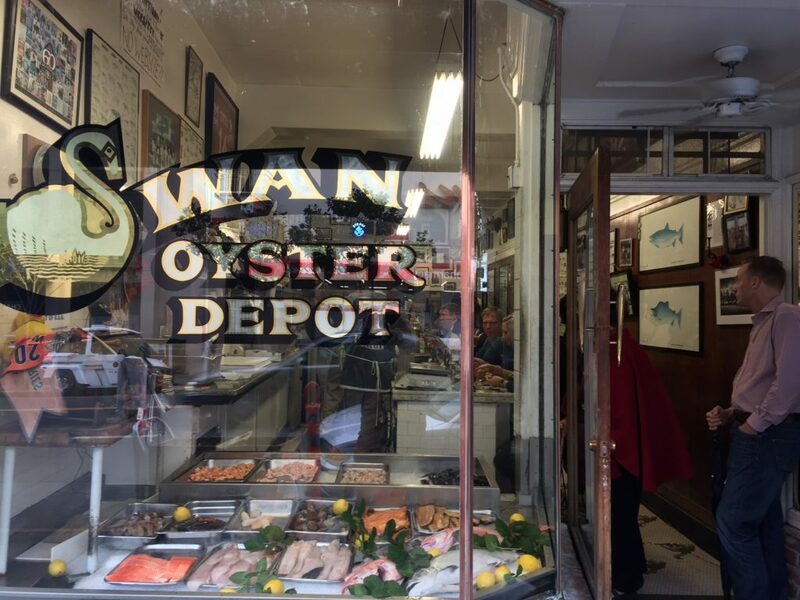 Swan Oyster Depot is nothing more than a counter, with no seats other than what you see at the bar, so when it fills up, it fills up quickly and with a vengeance – I don’t know what the seating capacity is, but it couldn’t be more than fifteen. 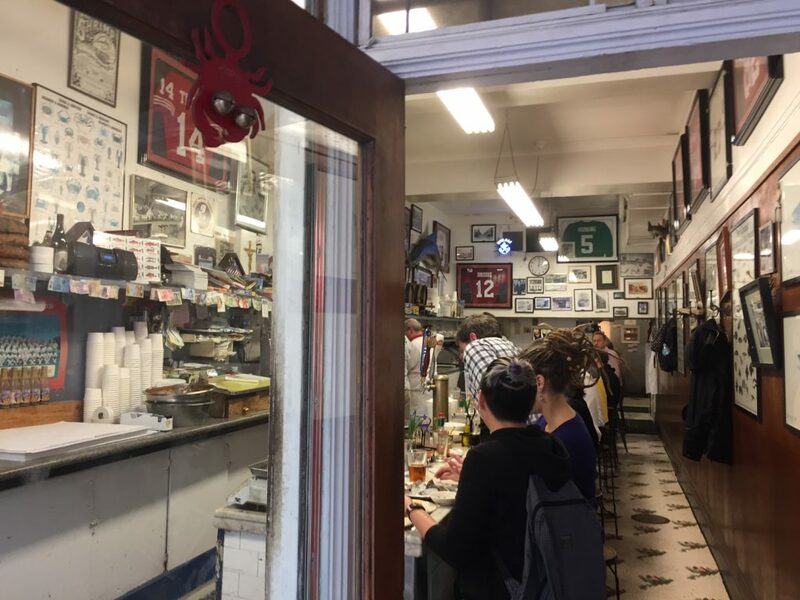 When you finally get in (the wait isn’t *that* long), you’ll note the knickknacks of a very old establishment – in this case, over one-hundred years old – which include the James Beard “America’s Classics” award they won in 2000, and a motley menu featuring the day’s seafood. 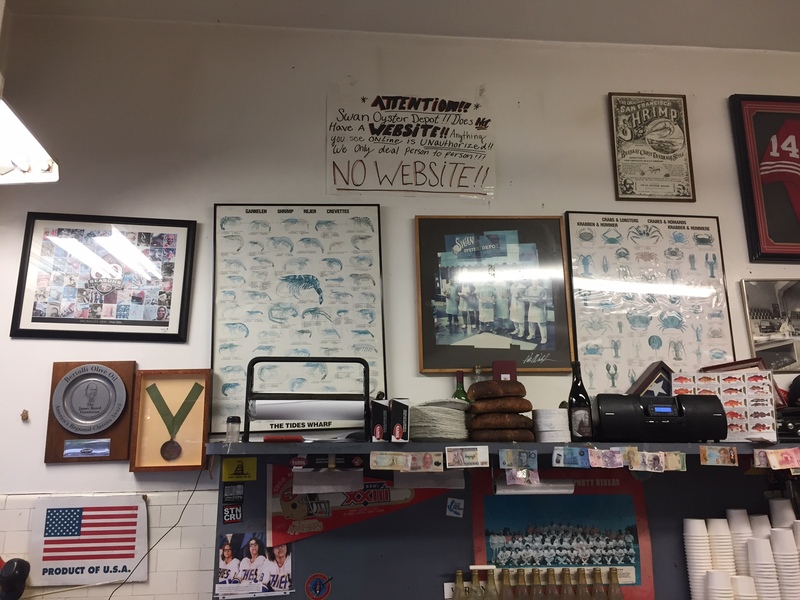 Note, by the way, the vehemently written sign about not having a website. 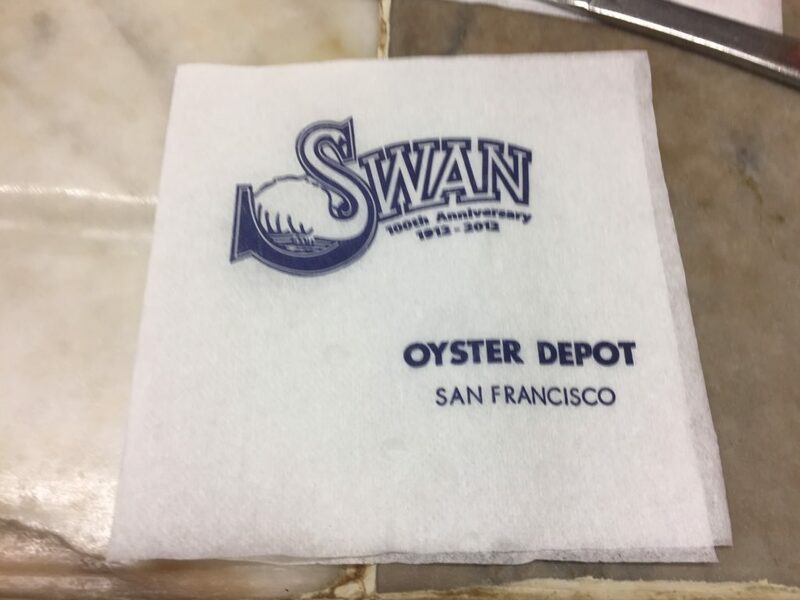 On the bar in front of you, you’ll see Swan’s napkins, a brief history of the restaurant, and a better-than-expected wine list, which breaks down into two possible choices: a bottle of Muscadet, or a few glasses of Anchor Steam ($6). Swan isn’t built for dining; it’s built for eating. Eating quickly, and eating well. 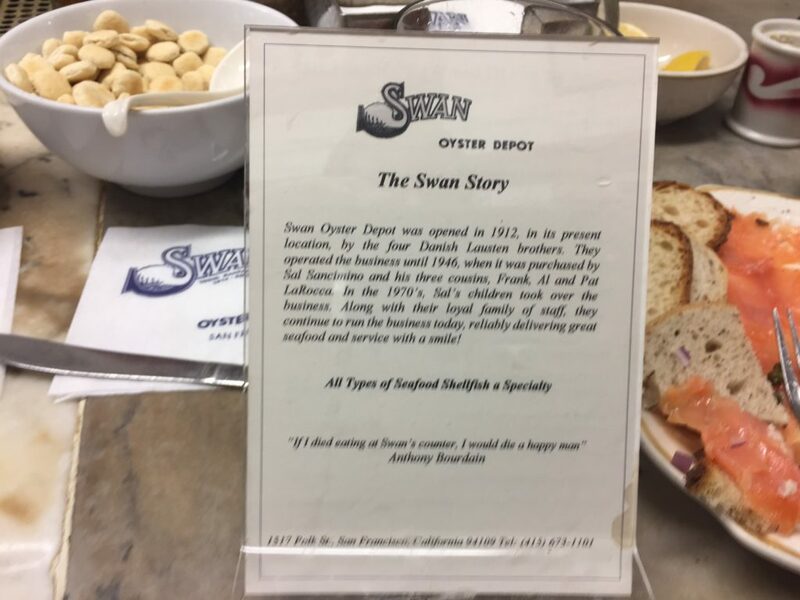 That quote by Bourdain (in the center picture above) isn’t at all wrong, and quite frankly, I think Swan Oyster Depot deserves a James Beard Award not just for being an “America’s Classic,” but for “Outstanding Restaurant in America,” although this is an owner-driven restaurant which may not even make it eligible. How much of an owner-driven restaurant? 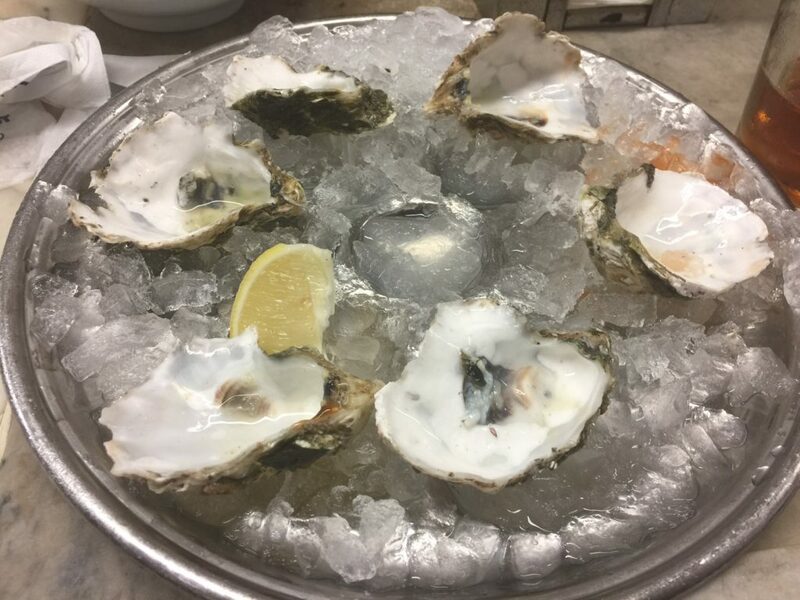 The first thing we ordered was Smoked Salmon ($13 – when I saw the size of the plate, I panicked, thinking we got the $24.50 item, but there must have been something else listed that I didn’t see) and six Malpeque Oysters ($18-ish). 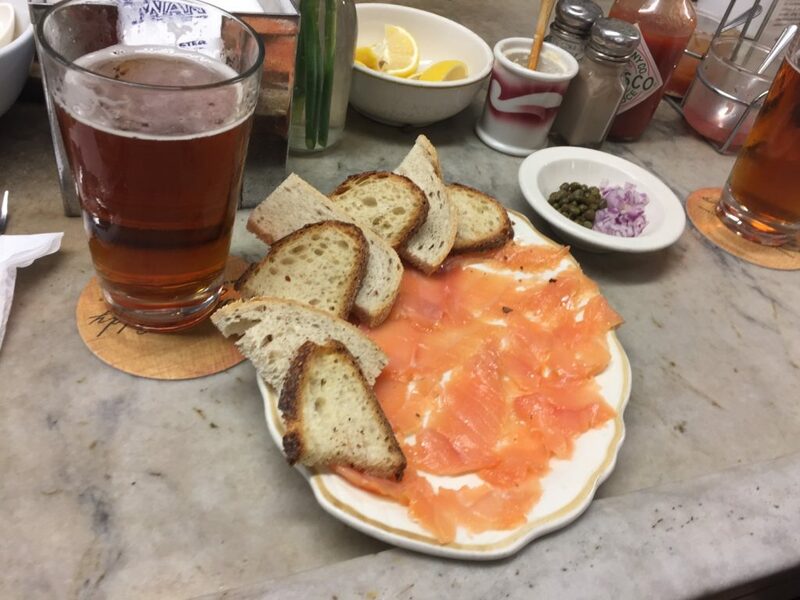 The salmon came out right away, and it was as good as any smoked salmon I’ve ever eaten – there was some *extremely* potent horseradish on the bar as well – so potent that you need to beware of it, using only a few fibers. 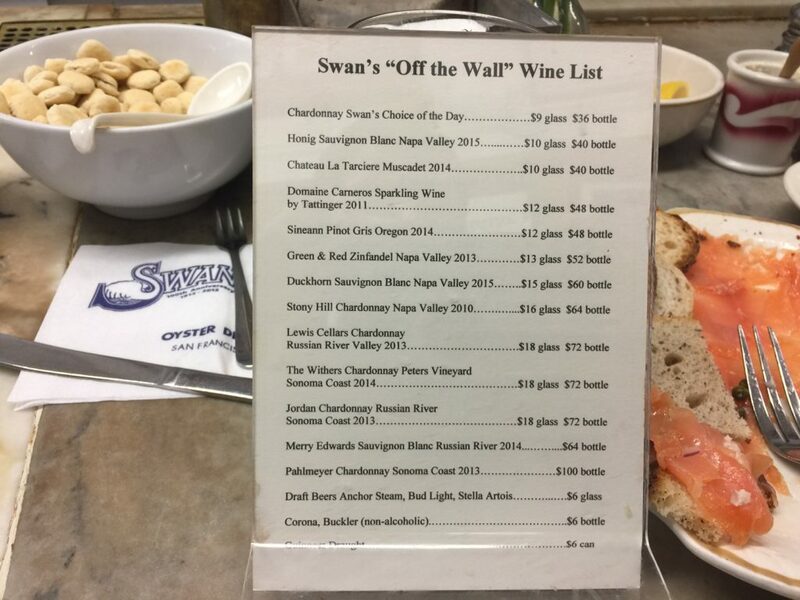 The Malpeques didn’t arrive, so I figured that Swan was following the trend of “serving things whenever they’re plated” – I was wrong. 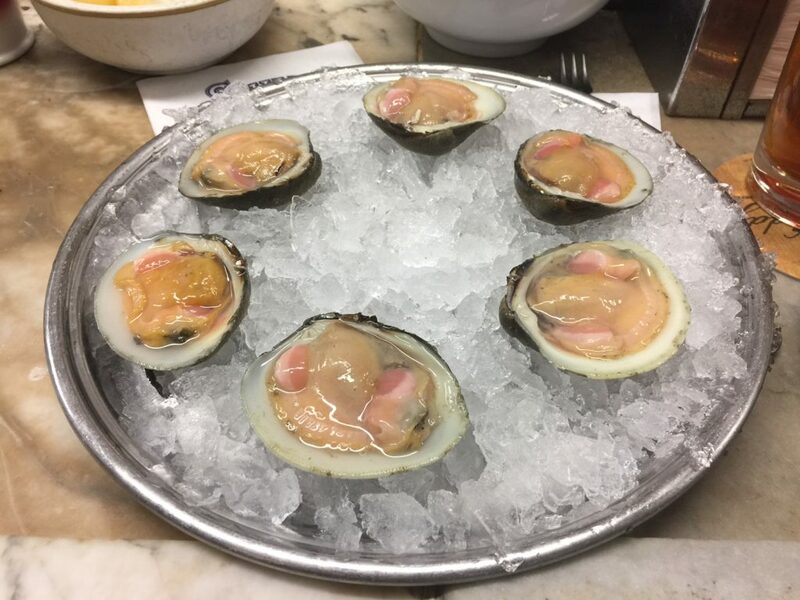 Next up was a half-dozen Cherry Stone Clams ($14), and these were the best Cherry Stone Clams I’ve ever eaten: batting two-for-two. 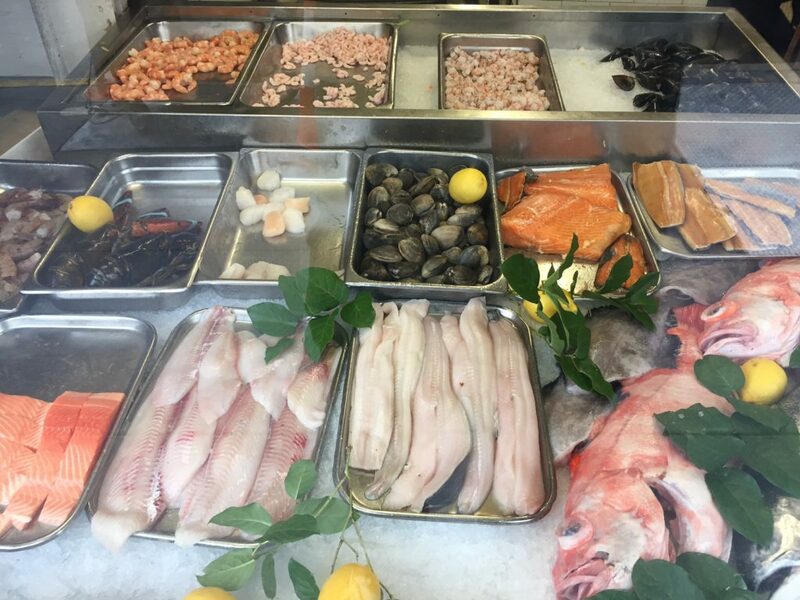 As good as they look – that’s how good they were. Then, a cup of Clam Chowder ($2.75) that was perhaps my favorite thing in the entire meal. It was so good that we ordered an entire *quart* to take home (I think that was $20, and worth every penny). Alongside of that, a Prawn Cocktail ($14.50), and if you could say this meal had one weakness, this would have been it. 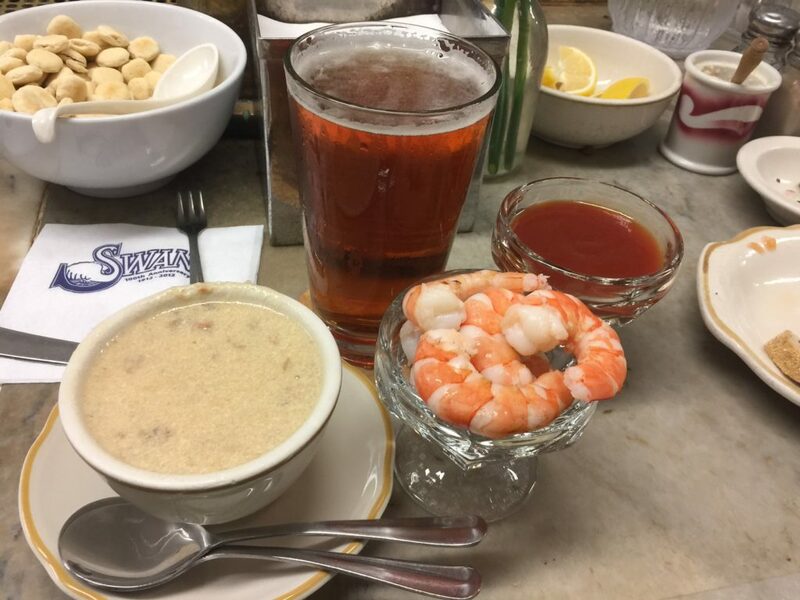 These were great; they just weren’t life-changing; the clam chowder, on the other hand, was something akin to a religious experience. About the non-blotchiest Malpeques I’ve ever come across. Not only were they blotch-free; they were just plain free: They were not added to the check. How’s that for putting the customer first? 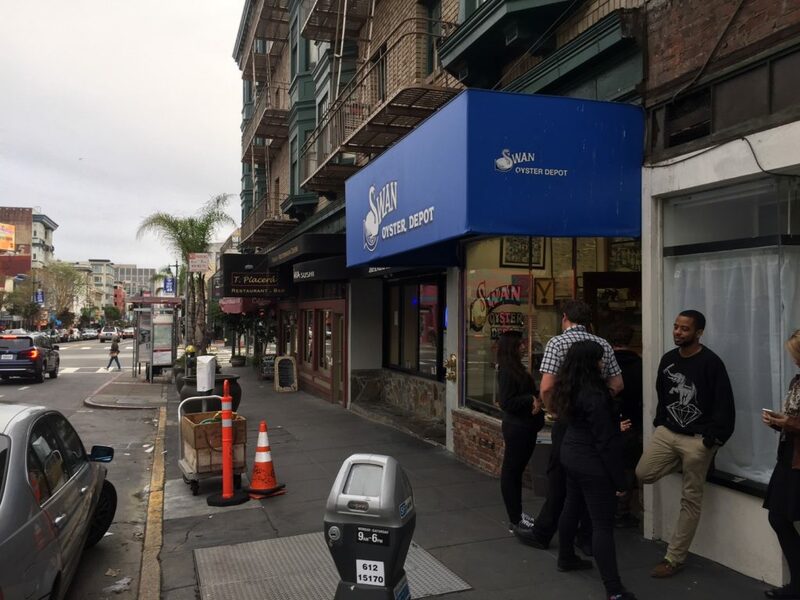 And of course, as I flew into a panic when the manager told me Swan Oyster Depot was cash-only, he reassured me that there was an ATM across the street, just as he has done a thousand times before. 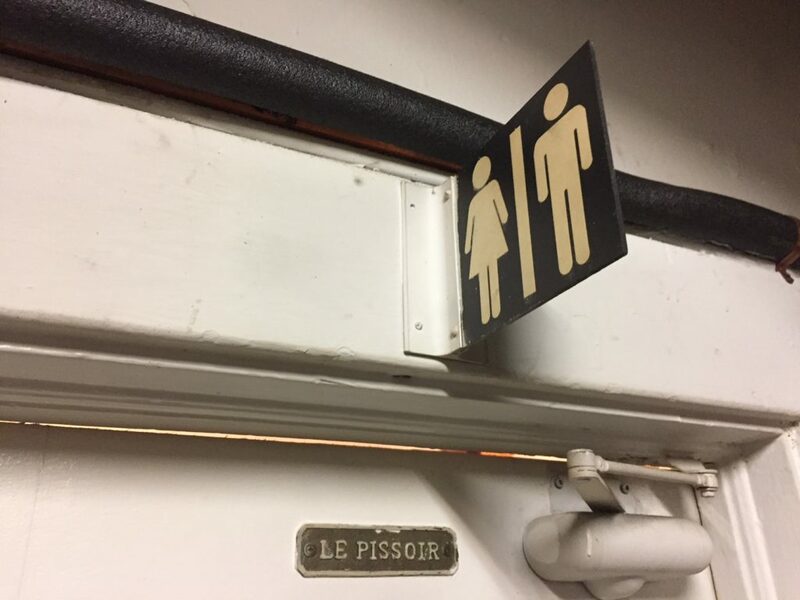 PisS – There is a very slang, somewhat crude, French word for “men’s urinal” that I have never before seen used in a real-life situation, not in DC, not in California, and not in probably twenty visits to France. Until now. 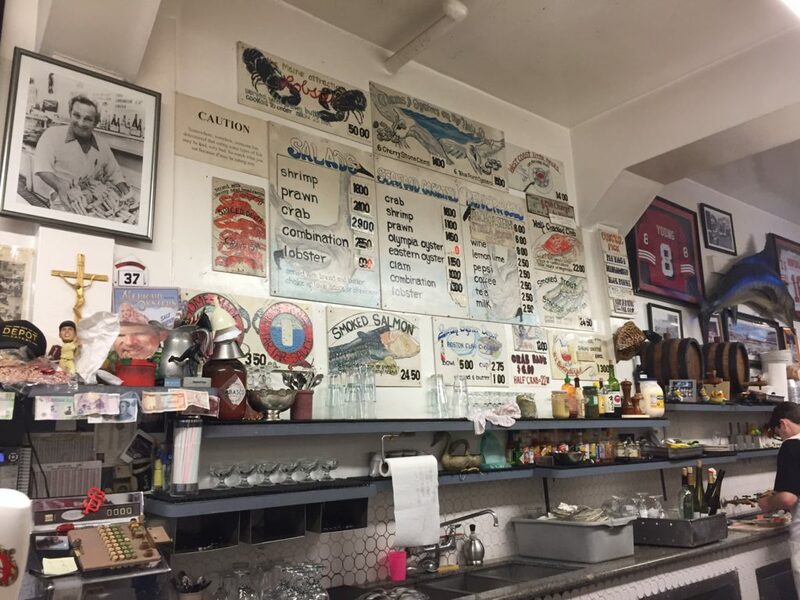 This entry was posted in Restaurants and tagged California, Nob Hill, Open since 1912, Raw Bar, San Francisco, Seafood. Bookmark the permalink.